As the sun sets on the shores of the River Forth let us give you a taste of what the Village of Lower Largo in "The Kingdom Of Fife, Scotland" is like. Lower Largo was a small fishing village that nestled on the coast of Fife near to the home of golf - St Andrews. The area has been inhabited for thousands of years with its Standing Stones and a temple that once was a resting place for the Knights of St John. 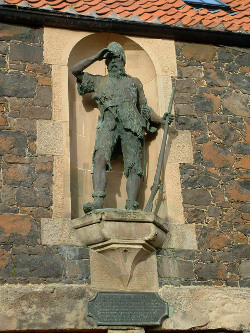 The village was once the home to Alexander Selkirk "Robinson Crusoe" who lived at 101 Main St. Please have a look at our website and enjoy a tour around the Cottage, Village, and many other sights. After, You may wish to visit the area for a short holiday and see the village for your self. 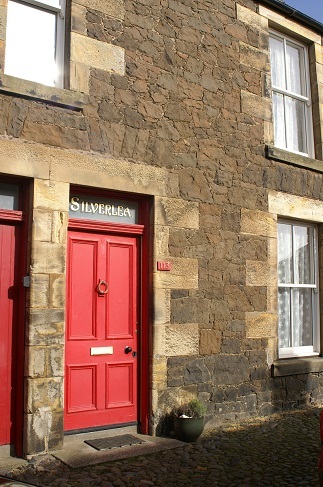 John & Ruth Richardson are the owners of 'Silverlea' (with the Red door). We would love you and your family to come and enjoy a visit to this very special village in the East Neuk of FIFE. For more information or to Book please contact us via this website or by e-mail. We are now back in the Netherlands after a beautiful week in Scotland. We enjoyed our stay in your house. We saw quite a few things in the area; not only Fife but also Perth and closer to the Highlands, not to forget Edinburgh. Nothing to complain about the weather; hardly any rain and sometimes very sunny. Thank you very much for giving us the opportunity to stay at your house. Had a lovely stay - nice and clean. Very handy for the beach. Would definitely come again.